Shropshire Prune is the definitive northern English damson, with a distinctive astringent richness which makes it a versatile fruit for culinary purposes. The centre of commercial damson production in the UK is Lyth Valley in Cumbria. Shropshire Prune (or its close relations) is the most widely planted variety in this area. Unlke almost all other fruit trees, damsons, particularly Shropshire Prune, actually like a damp climate - so if you live in the north or west of the UK, Shropshire Prune is worth considering. Shropshire Prune is a semi-clingstone fruit - the stone is not easily parted from the flesh. Please fill in the details below and we will let you know when Shropshire Prune damson trees are back in stock. Shropshire Prune is in flowering group 3. Shropshire Prune is self-fertile and does not need a pollination partner, although fruiting may be improved if there is a compatible tree of a different variety nearby. Since it flowers in the middle of the blossom season it can be pollinated by most other damson trees. Shropshire Prune produces a typical damson tree - fairly small but upright, with densely packed branches. While normally grown as a bush-tree, the dense branches mean it can also be trained as a productive hedge, although for the same reason it is not the best choice of damson if you wish to train as a fain. The tree is self-fertile, although cropping will be improved if there is another tree nearby. 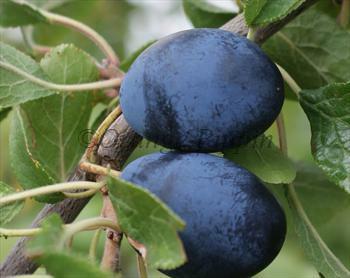 Like all damsons, Shropshire Prune is very easy to grow, but produces lighter crops than Merryweather. The main factor affecting the crop is the weather in April when the tree is in blossom. Rain, wind, or frost at this time can reduce yields - not necessarily through damaging the blossom, but by discouraging insects and preventing pollination. Apart from that there is nothing much to worry about. Pruning is unnecessary (except to remove damaged branches - if so, this should be done only in summer). For more information about growing and caring for damson trees, particularly Shropshire Prune, see the Westmorland Damson Association website. Shropshire Prune is an English variety, probably originating from the north-west, however its exact origins are not known.